Many physicians have an extremely high level of student debt. Fortunately, many are eligible for several types of forbearance programs and debt-reduction programs. The difficulty lies in choosing among them. 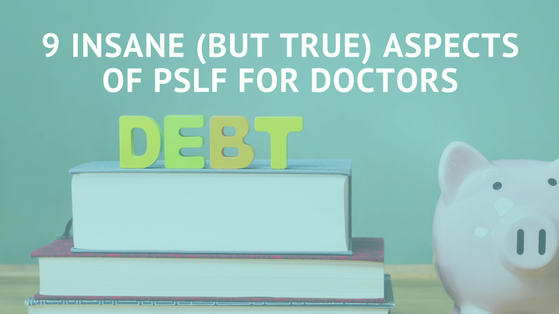 This article focuses on one of the more common debt programs for U.S.-based physicians, the federal 10-Year Public Service Loan Forgiveness (PSLF) program, which allows physicians who do public service to consolidate their loans and then make payments over 10 years, at which time the rest of the balance is forgiven. Many might not be aware that they will need to select from one of 4 payment options and that their choice of which program and when they sign up may have significant financial repercussions. The College Cost Reduction and Access Act of 2007 established a new public service loan forgiveness program. This program discharges any remaining debt after 10 years of full-time employment in public service. The government-sponsored program can cover virtually any field of practice. You don’t have to specify a specific loan because it can cover all of your loans (assuming they have been Stafford, Perkins, and other federally backed programs). The benefits are currently not taxable, but this could change in the future. As mentioned earlier, it is a 10-year program. The federal government will not forgive the balance until the end of the program. Qualifying employment is any employment with a federal, state, or local government agency OR a nonprofit that has a 501(c)(3) status.Also, this includes certain nonprofits that aren’t 501(c)(3)s.
LET ME EMPHASIZE THIS STRONGLY: If you are employed by a hospital that has a nonprofit 501(c)(3) status, you are probably eligible for this program! Make sure to be aware whether the arm that you are working for is a nonprofit or for-profit. Some nonprofit hospitals can have a for-profit subsidiary for tax reasons. While you are employed full-time for a public service organization, you must make 120 on-time, full monthly payments (this includes residencies and fellowships). Note that your monthly payments are substantially lower while in residency and fellowship. We will go through some examples later for after residency and fellowship. Think about this for a minute…. If you are in residency for 3 years, you will only have 7 years remaining on payments. Meanwhile if you have a fellowship for 3 years in addition to 3 years of residency, you only have 4 years remaining on payments! The bottom line is to make sure you to enroll while you are in residency and fellowship! If you have Federal Family Education Loan (FFEL) Program loans and/or Perkins loans, you need to consolidate them into a direct consolidation loan to take advantage of the program. This is a process will take one to 3 months to complete depending upon your situation. As you complete the direct consolidation loan, you must pick a repayment program. The 4 most common programs are the Income-Based Repayment (IBR) Plan, Pay-As-You-Earn (PER) Plan, the Income-Contingent Repayment (ICR) Plan, and the 10-Year Standard Repayment Plan. There are several differences between each of these plans. We have shown an example in the table below. *Based on calculators from http://studentaid.ed.gov/, assumes $150,000 in student loans. It also assumes that the person (1) is married, (2) has no kids or spousal school loans, (3) the original loans were $20,000 to $30,000 below the current loan amount and (4) the loans carry an interest rate of 6.8%. With the 3 primary plans of ICR, IBR, and PER, notice how the less discretionary income you have the lower the monthly payment required. Also, see how the higher your income, the more you have to pay? Also, note how ICR requires a higher monthly payment than IBR or PER because it requires a higher percentage of your discretionary income. Whereas, the Standard Repayment plan is fixed over 10 years. It doesn’t change with your income. What is discretionary income? It has a very specific definition: your after-tax income minus poverty guidelines published by the government. The larger your household, the more generous the guidelines. For example, a single person would have a baseline of $11,490 while a married couple would have a baseline of $15,500 and a married couple with a child at $19,530. You can find out more at http://www.familiesusa.org/resources/tools-for-advocates/guides/federal-poverty-guidelines.html. All else being equal, this means that a married physician with a child would have a lower payment than a single physician. In this article, we focus on IBR and PER as they require lower payments in residency and fellowship which can lead to greater debt forgiveness. Next, you start to make on-time monthly payments for the ensuing 120 months. Make sure to complete, with your employer's certification, the Employment Certification form EVERY YEAR or whenever you change jobs. Submit the completed form to FedLoan Servicing (PHEAA), the PSLF servicer, following the instructions on the form. PHEAA will review your Employment Certification form, ensure that it is complete, and, based on the information provided by your employer, determine whether your employment is qualifying employment for the PSLF Program. All-in-all, the PSLF program is an awesome way to potentially erase hundreds of thousands of dollars of debt. For thousands of young physicians with mountains of debt, this program is an incredibly important part of the debt reduction program. Make sure you check it out!